The dominant view among both scientists and laymen is that science can say useful things about the workings of the physical universe and about the invention and refinement of technology but nothing about what is morally true and about how we can best lead our lives. Sam Harris has written a book, The Moral Landscape, in which he challenges this view saying that science's reluctance to take a stand on moral issues has come at a price which is that science seems to have divorced itself from the questions which are most important for people's daily lives. Sam Harris argues that questions about morality are in essence questions about the well-being of conscious creatures because the concept of well-being captures all that we can intelligibly value. 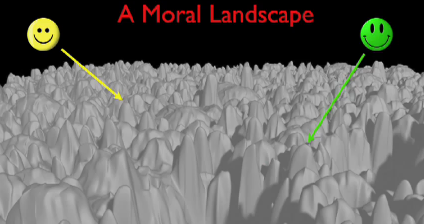 In his book he proposes a hypothetical space which he calls 'the moral landscape' which he defines as follows: "A space of real and potential outcomes whose peaks correspond to the heights of potential well-being and whose valleys represent the deepest suffering. Different ways of thinking and behaving [...] will translate into movements across this landscape, and, therefore, info different degrees of flourishing." He acknowledges that there may be multiple answers to moral questions which may be equivalent and points out this poses no problem. He compares this situation with the effects of eating on health: "No one would argue that there must be one right food to eat". This does not mean however that science cannot say anything about the effects of different types of food (or behaviors) on health (or well-being). Also, it is no problem that the concept of well-being is still vague to some extent. The same goes for the concept of health which does not stop us at all from scientific inquiry into health and from having a scientifically based health system. There are in principle right and wrong answers to questions about the effects of what people do on the well-being of themselves and others. These answers may be very hard to find in practice but there is no principle reason they can´t be found. I think this is brilliant. What Sam Harris does is propose a convincing ultimate criterion for answering questions about morality. Building a body of knowledge about morality and about how to live a good life will be a difficult, slow and long-lasting process, no doubt. But there is no reason it can't and should not be done.